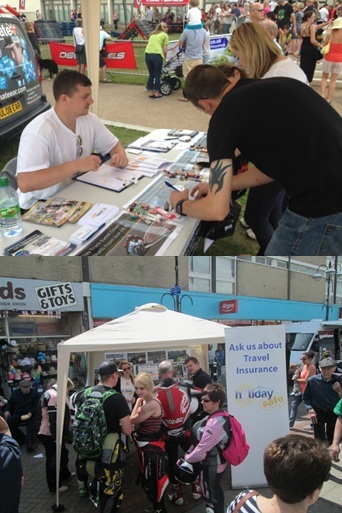 At Holidaysafe, we’re particularly passionate about Motorcycle travel, which is why we decided to launch our ‘Win a GoPro’ prize draw for all attendants of the Hastings Bike1066 show in May, and the Bexhill MotoFest event in July. We chose a GoPro as our prize because they are the perfect gadget for any biker or keen sportsman – ‘the world’s most versatile cameras’ which allow people to film and share their greatest experiences. Imagine recording your ride along Route 66 at sunset, or the moment you ski down a flawless snowy mountain – your greatest travel moments will be captured for you on film to relive again and again. When we contacted him to announce his win, Mr Platten commented “Thank you very much! I am very amazed and stunned to win such a fantastic prize.” Mr Platten is a keen biker who takes his bike abroad, so the GoPro should come in very handy for catching all those fantastic touring moments. On behalf of the entire Holidaysafe team, I would just like to thank Mr Platten once again for taking part in our prize draw, and to everyone else who also took part at both events. If you’re planning a motorcycle trip, visit Holidaysafe.co.uk for more information about specialist and affordable biker travel insurance.